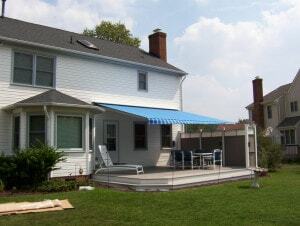 with any Custom Home Retractable Awning order. Home retractable awnings are the perfect solution for your outdoor living space, allowing you to enjoy your deck, patio or porch more than ever. Outsmart the weather with a shady retreat that will protect you from both harsh sunlight and light drizzles. Our customers say they use and enjoy their outdoor spaces more than they ever imagined and their only regret is that they didn’t make the decision to purchase one earlier. Easily control the brightness inside your house, and lower utility bills up to 40 percent with a manual or motorized retractable awning. Keep the awning lowered on hot, sunny days or put the motorized awning up on cloudy days to brighten your interior rooms. Motorized retractable awnings make the transition as easy as the push of a button. The best retractable awnings are available from A&A Awnings and Storm Shutters, where your view is never blocked by pesky side support poles. Retractable Awnings add value to your home and help you maintain the value of your interior as well. UV rays can quickly damage and fade your furniture, carpet, upholstery, and artwork. But keeping the drapes drawn for protection can make your home look like a cave. Extending your retractable awning on a sunny day can block up to 95 percent of the sun’s damaging rays from your home’s interior, keeping your furnishings in great shape and allowing you to keep the drapes open to enjoy your outdoor views. The transition is as easy as a touch of a button with our affordable, top quality motorized awnings. When rain hits, adjust the pitch of some models of our home retractable awnings to the angle of your choice to shed water to one side. And when wind speeds reach 25 mph and above, you’ll enjoy the ease of retracting your beautiful motorized awning to protect it from extremely harsh winds and flying debris. Retractable awnings tend to have a longer life than others. When rolled up, your awnings will stay clean and protected from the elements. Get the perfect retractable awning to match your style and home at a great price. Our awnings are custom made in our factory, allowing us to offer a custom price to fit your budget in a wide variety of colors and sizes. We will use our decades of experience to help you choose the perfect retractable awning to help you “extend” your backyard fun for years to come. All our awnings are constructed to achieve the highest standards of appearance, functionality and quality. Our continuous fabric bar design adds a special aesthetic touch, hiding the metal frame and seams of your retractable awning, and our extruded aluminum frames are powder coated to resist corrosion. We use super durable GOR-TEX® thread to greatly extend the life of our awnings, and we offer a 10-year warranty on fabrics. Ask about our LIFETIME warranty on frames! Give us a call today at 757-463-1446 to discuss your new awning. The only regret our customers ever have about their awning purchase is that they didn’t make it sooner. Life is Better in the Shade.™ Extend your backyard fun with a retractable awning made right here in Hampton Roads in our Virginia Beach manufacturing facility.